If you are looking for an alternative to the classic promotional lanyard, promotional retractable badge holder clips are a great solution. Retractable Badge Holders or Badge Reels are popular at tradeshows, conferences, meetings and seminars. 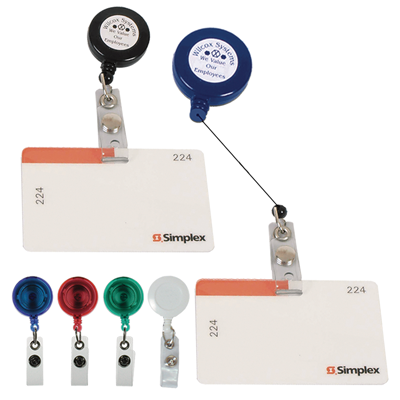 Promotional retractable badge holders make showing ID convenient. Handy clip allows Badge Holders to hang from pockets, belts or purses. You will find the ideal promotional badge holder to properly advertise your company's products and services. Give us a call (706-374-0710) for a FREE quote and to put our years of promotional and advertising experience to work for you. COLOR(S) AVAILABLE: Solid: Black, Blue or White. Translucent: Red, Blue or Green. SET UP CHARGE: $55.00 on new orders. $25.00 on re-orders.